NoMo Nausea Bands relieve nausea INSTANTLY by providing the soothing powers of peppermint aromatherapy within a gentle anti nausea acupressure bracelet designed by an anesthesia provider. NoMo Nausea is clinically approved 80% effective 3:1 anti nausea relief band that works in 30 seconds to stop vomiting, distract your mind, and ultimately leave your upset stomach behind. Each resalable freshness bag contains TWO fast-acting, drug-free, non-drowsy, reusable, recyclable, and waterproof essential oil infused sea-band naturally made anti nausea wristbands. 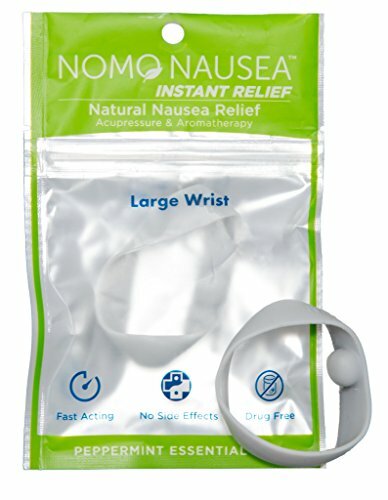 NoMo Nausea Band infuses natural peppermint oil within a stylish waterproof acupressure wristband. This elastic drug free, latex free, and stylish set of 2 adult wristbands (made for Medium to XL wrists, over 6 1/4" around) provides INSTANT nausea relief. Our new stronger more elastic material leaves the guess work behind and provides the perfect amount of pressure upon the P6 acupuncture site made to stop nausea. Our clinically approved & doctor recommended 3:1 acupressure and peppermint aromatherapy bracelet have been shown to decrease nausea and vomiting after surgery, motion sickness, morning sickness, vertigo, chemotherapy, hangovers, and much more. How do they work? Our 3:1 design combines: 1. Fast acting peppermint aromatherapy to stop vomiting in 30 seconds because the fastest way into your brain is thru your nose. 2. Peppermint Essential Oil Distraction Technology to change the temperature on your wrist to make your mind forget you were sick in the first place. 3. Long Lasting Acupressure to increase anti nausea hormones to help stop nausea before it starts. So get three powerful anti-nausea products in one band! Because of the multi-modal approach, new studies show you only need to wear one at time.